Please don’t clip your horse because you feel you ought to because “it’s the fashion” or “everybody’s doing it”. The number of horses I’ve seen over the years given full clips and ridden rarely whilst also being dosed up with fizzy food only for the rider to sit on the poor pony once in a blue moon and be shocked that it’s fizzy – what did they really expect! Beginning in August (in the UK) horses and ponies start to get rid of their summer coat and grow a thick coat as their bodies prepare for winter. You’ll know this is happening when you start to get loads of hair on your brushes and they start resemling carpets. At the moment my horse has a blanket clip…… next year I think he will have a full one. Since September last year he’s been clipped twice – it’s now January. I could clip him again, but at the moment you can still see the clip and because I do a lot of showing I wouldn’t want there to still be lines in say April so I’m not bothering. Belly and neck clip – The hair is removed from under the belly upwards between the forelegs and up the lower line of the neck and lower jaw. This is suitable for a child’s pony or an adult’s hack as it permits the horse to be turned out into a field but also allows the horse or pony to do some work without getting overly hot. Chaser clip – The hair is removed from under the belly upwards between and around the front legs and up a line on the neck, (dependent on how high you require the line to be. It is useful on a youngster, which is being clipped for the first time as it does not take as long as the others and is practical. Trace clip – There are two types, the high and the low trace. The coat is removed from the belly and the underside of the neck. Hair is left on the head, the topside of the neck, body and legs for warmth and protection. For a low trace only a small section of hair is removed from the belly and neck. 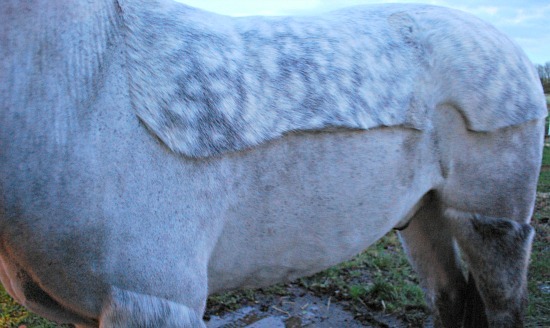 A high trace takes more hair from these areas going further up the horse’s flank. This clip allows horses and ponies to be exercised without getting too hot. It also permits them to continue being turned-out in the. Hunter clip – The legs as far as the elbows and thighs, and a saddle-patch are left with unclipped. The hair on the legs acts as a protection against the cold, mud, cracked heels and injury from thorns, however they can be carefully trimmed and the saddle-patch saves a sore or scalded back. Full clip – This is usually given to competition horses that compete in the winter months. The whole of the coat is removed, including body, legs and head. If you choose to buy your own clippers they are far from cheap and probably only worth it if you’re expecting to clip a few horses every year. Not only are they costly but they need maintaining – the blades sharpening and lotion/oil bought for when you are clipping. At present my instructor clips my horse for me with me stood alongside with a huge bag of carrots to regularly feed. Most horse owners would hate their horses to be sedated but for some needing clipping this has to be done – they just can’t cope with the sound, sensation and smell of the clippers and go la la. My advice would be to consult your vet and they’ll advise the easiest and best way to sedate your horse. For their safety and that of the person clipping it’s important. Also I’ve seen far too many horses with strange clipped stripes or half a neck done which look a tad odd. Depending on the clip you go for rug accordingly.